Well after surviving travel days through Desmond, Eva, Frank and whatever family storm was brewing at home over Christmas, I was finally able to take advantage of a weather window at the back end of last week, and decompress from what has been another hectic period. I was planning to head back out to Knoydart as I did this time last year, because I still need some photos of Glenpean, but in the end I decided to keep it simple and return to the area west of Corrour Station, which over years has become very much home territory. My usual stopover is at Staoineag, a bothy I’ve stayed in a grand total of nine times, the most of any bothy that I’ve made acquaintance with. 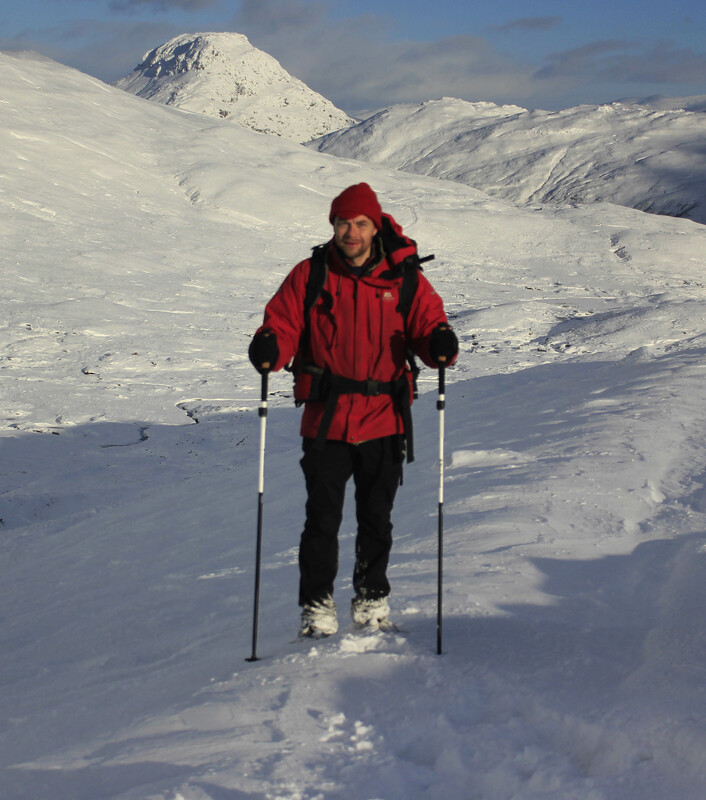 However, on this occasion I pushed onto Meanach, a couple of miles further towards the Glen Nevis watershed. 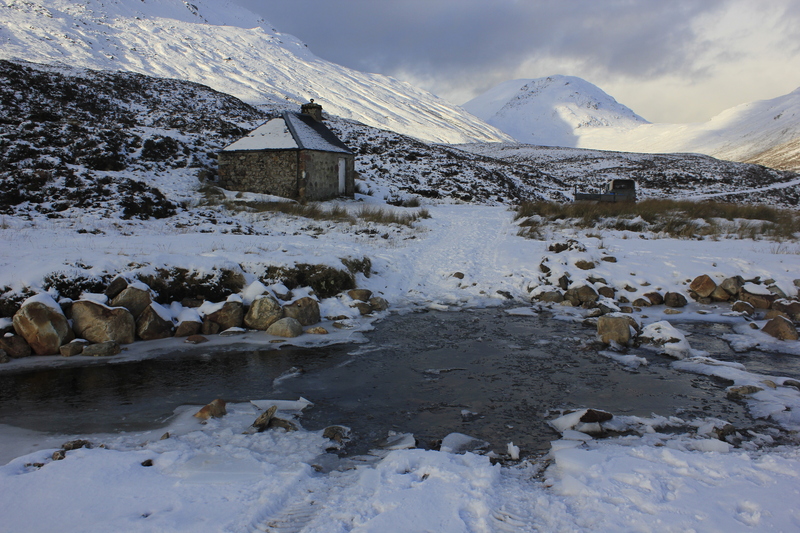 Although the bothy is more basic than its close neighbour, Meanach is set in a wide open stretch of floodplain between the Mamores and the Grey Corries that is very photogenic. It was a little strange to walk past one of my favourite bothies, though my dilemma about changing plans was tempered by the fact that the walk in to Meanach takes you on the opposite bank of the Abhainn Rath. There are stepping stones across the river at this point, but I was pretty focused by then, and resolved to pop in on the way back, just to make sure it wasn’t too offended. As with any trip in the winter I was carrying in coal – a light weight 5kg on this occasion – though for some reason I’d decided to lug it in in my OMM sack, papoose style over my chest, rather than stick it at the top of my main sack. I think the reasoning was that it was easier to get on and off the train with hand luggage as it were, but I don’t think I’ll be doing it again. 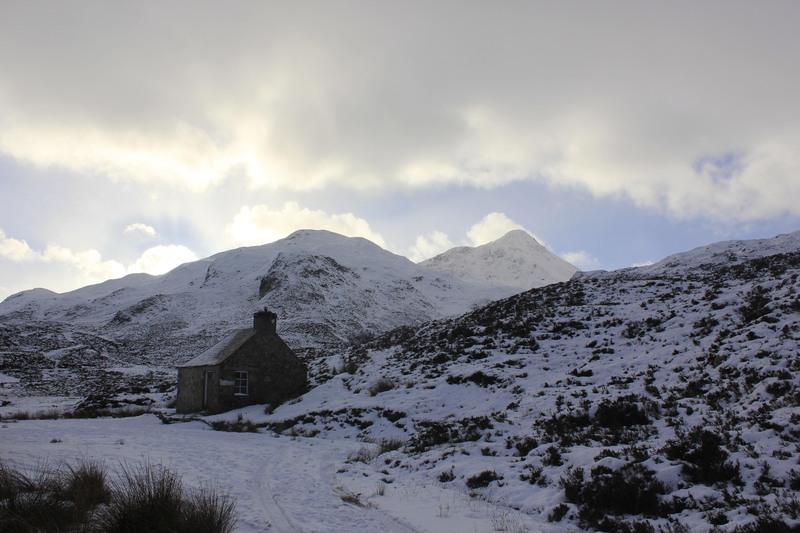 I was really starting to toil when the bothy finally came into view, and I was very grateful for the new walking poles I had bought on impulse the day before. Anyway, once I got the fire lit and candles placed around the room, everything made sense again. And although I did make an attempt to asphyxiate myself through a combination of a badly drawing hearth and a cold windless evening, I snuggled up in my sleeping bag and went to bed very content. 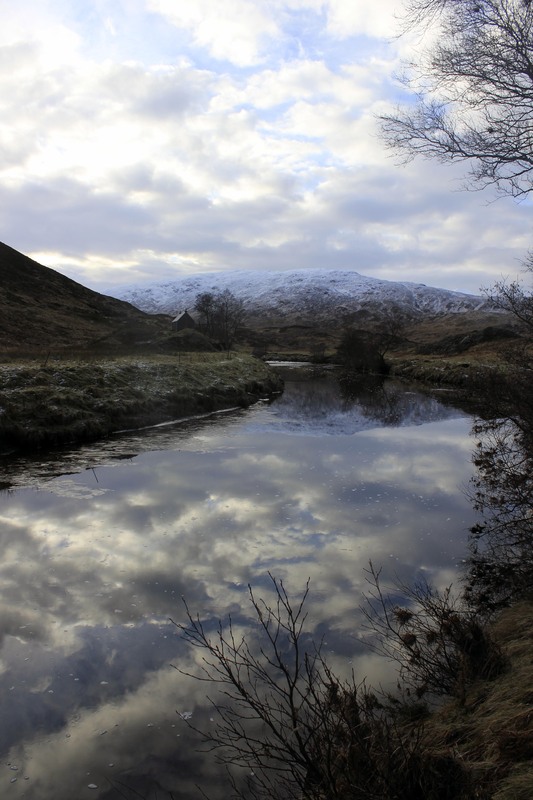 In the morning the extra effort was richly rewarded as it had snowed overnight, and the sky was clear. There is something about early morning winter light reflected by fresh snow which I find particularly atmospheric, and although the best shots always come when the sun pops out, I had a very happy morning taking a few extra exposures for the archive. As it was January the said sun did take its time to finally poke its head above the horizon, but I got the image I wanted, and gleefully headed over the bealach to Lairig Leacach in time for lunch and another photo opportunity. 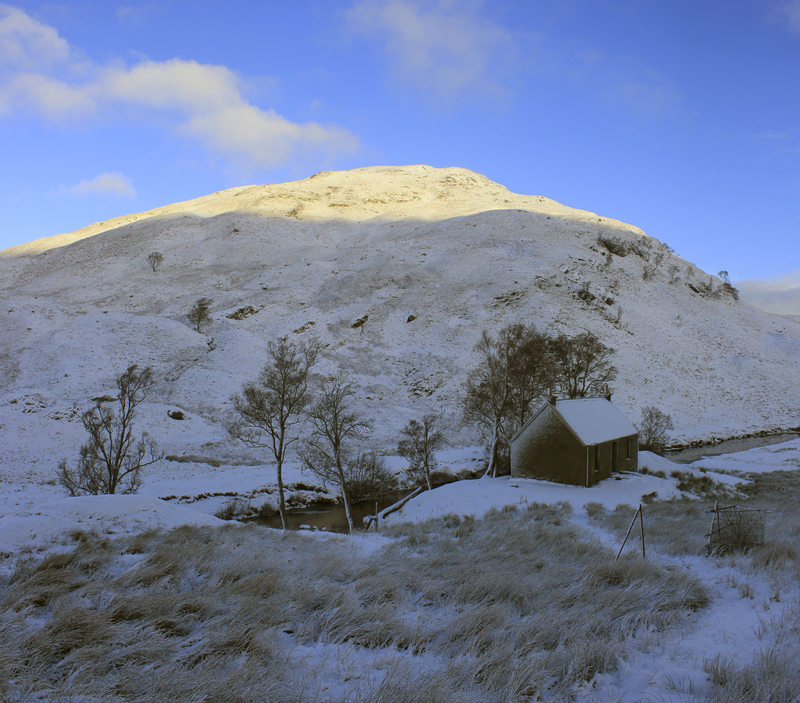 Here I bumped into a very engaging member of a Winter Skills Course who had unfortunately injured his knee, and had been passing the time waiting for the group’s return from digging snow holes at the top of the Easians, by cleaning out the bothy. I did just about extend my range of conversation beyond you know what, but inevitably edged round to it after a pregnant pause or two. 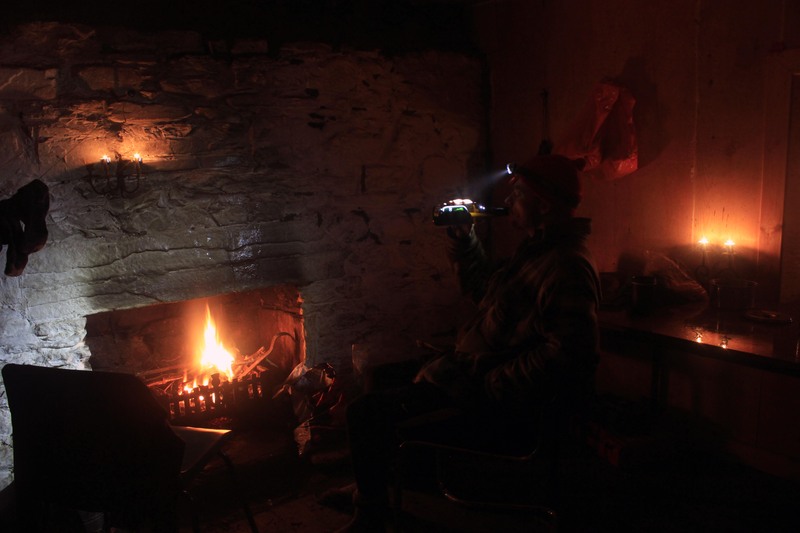 Well we were in a bothy after all. Then it was off back down to the head of Loch Trieg and the final objective of the day, namely a wood collection from the plantation behind Creaguaineach Lodge. I’ve often ambled down here from Staoineag to add to any supplies of fuel I have carried in, but I have to say I pulled out a few stops to get a full sack of branches back to Meanach. It was getting dark as I lumbered up past the final waterfall, and I was conscious that I didn’t want to slip and tweek something myself, because it would have been a long old trudge back to Corrour the following morning. Job done, I had a very satisfying day two fire and the last of my wine, and spent a fruitful couple of hours scribbling notes about future schemes, now that I’ve completed my first objective of the round of MBA’s. I hadn’t got a clear idea about what was next, even the week before I set out on this trip, but it seems obvious now that I will just continue on with my long list of non MBA’s, which should keep me out of mischief for a good chunk of time to come. As so often happens, I was up early again on my leaving day, and although I was booked on the evening service back to Glasgow, and had planned just to mooch about the bothy a bit before packing up, I was a bit restless, and decided to head out, knowing I could meander back to Corrour pretty slowly. 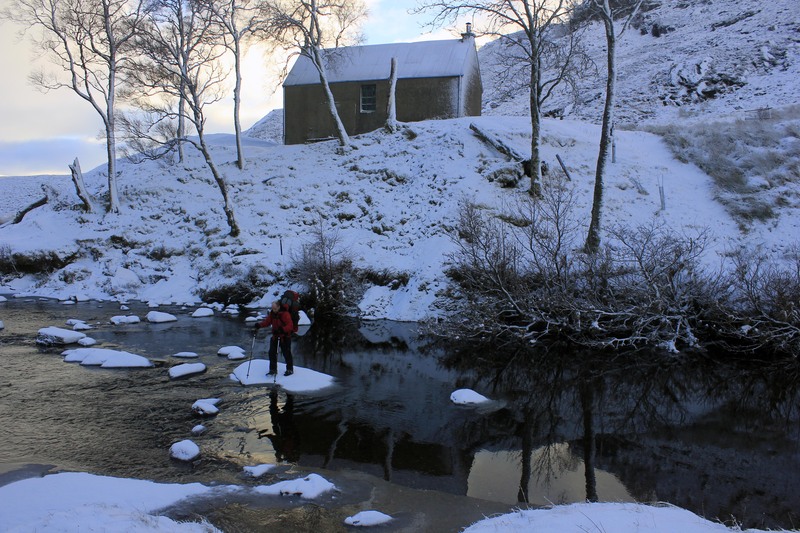 I also had had the offer of a cup of tea by the friendly warden of the Loch Ossian Youth Hostel, who I had met on the station platform as I was heading off, so I knew I wouldn’t be freezing my arse off for hours on end if I arrived ridiculously early for the train. And man was I rewarded again with the pre dawn light. Any grumpiness just melted away as the colours just kept changing, and I almost floated along, so thankful again that I have been able to make it out to the hills between the seemingly relentless series of Atlantic fronts which are so much a feature of the Scottish weather, especially at this time of year. I even got a pretty cool set up of me crossing the steeping stones outside Staoineag, which is a banker shot for the book. Tea brewed, I had another random chat with an passing twenty something on a mission to run all the way to Dalwhinne by night fall, having started out at Fort William at 6 that morning. I gave him the heads up about the potential depth of snow at the Bealach Dubh before you head down to Culra, but he was very much undeterred. Having made a mental note to head back here at some point before the year was out, it was time to head back to Corrour and that promised cuppa at the youth hostel, which was very gratefully received. 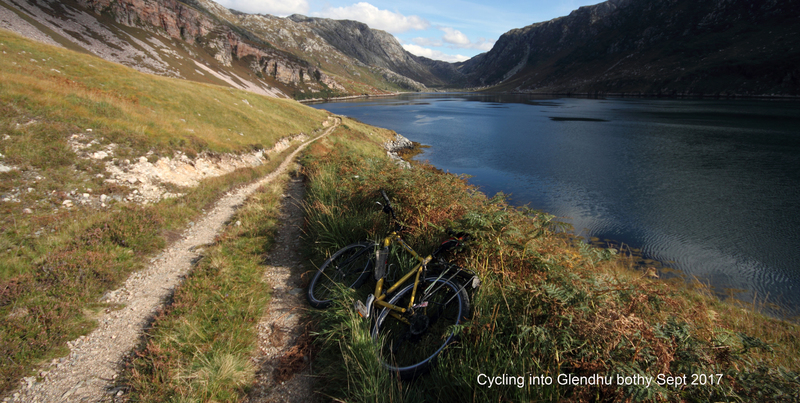 This entry was posted in walk ins and tagged Lairig Leacach, Meanach, Staoineag on January 19, 2016 by bothiesonabike. Chris Minty on what would Ray do? Mappit is a platform for creating easy to use participatory maps for public consultations and niche interest groups. Welcome to my blog full of images.